Living rooms rank as one of the most important spaces in your home. It’s where you entertain those who are closest to you. It’s where you watch your favorite shows. It’s where you take your weekend naps to recover from a crazy week. Living room furniture matters and so do budgets! Come shop our amazing living room collections that are on sale now, and find the perfect piece to upgrade your living space! From sofas and sectionals to recliners and media centers, we have what you need for a price you can afford. Browse our living room options online or visit your local store today. 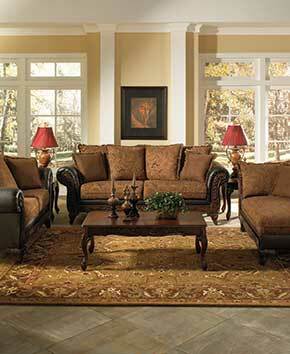 Not sure what living room group best suits your needs? One of our friendly associates will be happy to help you find the perfect pieces at amazing sale prices. Don’t forget to ask about our in-house financing options. With a striking flared frame and no-sag spring seating, the Emma sofa is designed to stand up to daily use. Four sizeable back cushions hug you as you lie back and relax. Padded arms add to the soft, comfy feel. Stress welts help prevent tearing that would expose the underlying foam and frame. Zippers are located on all cushions, seat backs and arms so you can easily rejuvenate the foam.Pieces are available in brick red, cobblestone grey, café chocolate and sky blue colors. Covered in 100% Polyester. Cleaning code: “W”. Fine lines and great curves make this collection a spectacular way to turn a living room into a cozy and sophisticated retreat. Padded arms, chunky pillows and ultra-soft 100% polyester upholstery will envelop you in contemporary comfort. Pieces are available in brick red, cobblestone grey, café chocolate and sky blue colors. Covered in 100% Polyester. Cleaning code: “W”.